Another day, and another top ten ranking for the City of Raleigh. A couple days ago portfolio.com declared Raleigh North Carolina as the #1 quality of life among top metro areas. 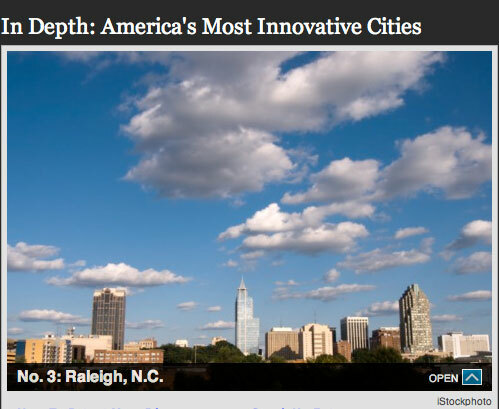 The next day Forbes top 10 list of the America’s Most Innovative Cities, and Raleigh places a respectable third. The ranking is based on the top 100 US metro areas, taking into account factors including ratios of high tech, scientific and creative jobs, patents per capita, and venture capital. San Jose was given the top honor in this list. And once again Forbes sourced of one of KCG Art Director David Kilian’s Raleigh skyline photos for their article. Thanks, Forbes! 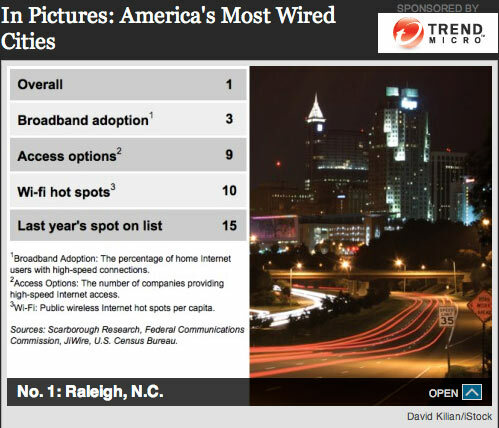 Surprising many last week was the naming by Forbes magazine of Raleigh North Carolina as the #1 ‘Most Wired’ American city, just beating out Atlanta and Seattle. Several factors determined the 2010 rankings, including the penetration of broadband access into the area population, Wi-Fi hotspots, and marketplace options for broadband. “The city’s high concentration of IT companies, research universities and state capital resources” were cited as deciding factors according to the article. No doubt the recent adoption of free Wi-Fi in downtown Raleigh played in. See the full city rankings here. Also of note, when we saw the article it made us smile– Forbes used of one of KCG Art Director David Kilian’s Raleigh skyline stock photos.